It is that time of year when things go bump in the night. With that in mind, Doc loaded me in the car and took me on a real live ghost adventure to the most haunted Inn in America, the Buxton Inn. 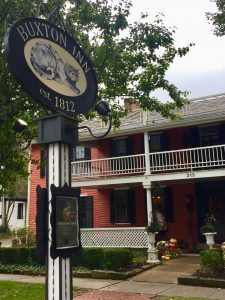 Located in Granville, Ohio, Doc told me the Inn was built in 1812 and has had many distinguished guests including Harriet Beecher Stowe, Yo Yo Ma and even President Abraham Lincoln. Now that is all very impressive , but that’s not why we came. As we got out of the car, the first thing I noticed was a big sign out front with a black cat on it. Can you imagine that? I think a picture of a nice dog would be better, but that’s just me. When Doc told me why the cat was on the sign, it sent shivers down my spine. The cat’s name is Major and although it is dead, its spirit is often seen roaming the halls, resting in rooms or heard softly purring in peoples ears. Creepy! After hearing that I decided to walk behind Doc as we went up the front steps of the Inn. If that cat appears, I figured it would haunt her first. As Doc slowly opened the large front door it was if we were going back in time. The nice lady dressed in period attire from the 1800’s welcomed us and was happy to tell us about all the ghosts that reside there. Besides Major the cat, the spirit that is seen the most often is “The Lady in Blue.” A former owner and talented singer and actor for most of her life, she ran the Inn for twenty-six years. Always greeting guests in an elegant blue dress she apparently decided to maintain the same fashion into the after life. Inn staff, patrons and visitors have reported catching glimpses of her. She most often is seen in room #9 where she died, a room I won’t be spending the night in. Other notable owners of the inn that have passed on, but not moved out are Orrin Grange the original owner who is often seen at night sneaking pie from the kitchen. It’s comforting to know you can still have pie when you’re gone. The second owner, Major Buxton, is seen as a shadowy figure that sits in the dining room. After the nice lady gave us the low down on the ghosts she invited us to walk around the building. I will admit that I was a little freaked out but Doc showed no mercy when she told me I need to be more afraid of the living than the dead. The employees at the inn were happy to talk about the eerie footsteps they hear, unexplained whispers in the hall and shadowy figures that pass by. Seeing my discomfort, one of the wait staff bent down and said, ” Grover, don’t worry, our ghosts will never harm you.” I looked back at the waitress and Doc and told them it was time to leave. Before leaving, we asked the nam of the nice woman that greeted us. The waitress asked us to describe her and as we gave her the description a strange look came across her face and she motioned for us to look at a portrait on the wall. ” Is that the woman?” she asked. We both shook our heads yes. ” Count yourselves lucky, you have just had an encounter with one of our friendly spirits. Doc and I practically ran over each other trying to get out the front door of the inn, jumped in the car and drove away. Apparently the ghosts at the Buxton Inn continue to watch over it and remain at peace there. I was just happy I didn’t run into that cat. It’s turning fall in the midwest so Doc thought it was a good time of year to take a group of patient’s back out to the horse farm. As you recall Doc has been using equine assisted therapy to help patient’s enhance their emotional growth. 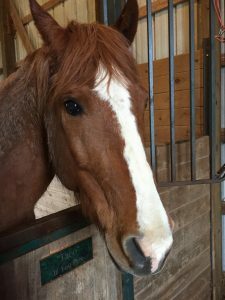 The work we do at the farm with the horses acts a metaphor for what is going on in the person’s life and today was quite an awakening for most of the group members. 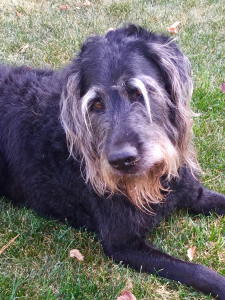 From this dog’s perspective, humans spend too much time listening to what others have to say, forgetting that it’s the behavior that always tells the real truth. Ignoring people’s behavior gets some of you in big trouble. Knowing that can be a problem for many, we worked on a exercise that would bring that to light. First they had to pay attention to the horses body language as they approached their space. We often forget that non-verbal communication counts for about 93% in humans because you all love to hear each other talk. Since the only way animals communicate is non-verbally the group had to learn and then pay attention to their language. All was going well with he exercise until one of the big draft horses that is still growing at age 2 decided to approach Doc when she wasn’t looking and attempted to pull the watch right off of Doc’s wrist. It was a battle of non-verbals when Doc pushed the horses head away and then that big 1800 pound baby reacted by trying to bite the toe of Doc’s boot. No harm, just a youngster trying to test the boundaries. So at the end of the day what did everybody learn? When they respected the horses body language and their space, the horses were calmer and more willing to engage. We talked about the importance of respect as part of the communication process whether it is horse, dog or human. It’ s easy to forget sometimes especially if we are intent to get what we want or are trying to get our point across.